Heat two tablespoons oil in a kadhai, add shahi jeera and sauté till fragrant. Add corn paste, almond paste and boiled potatoes, sauté till the moisture evaporates and mixture is dry. Now add black pepper, red chilli, saunf and garam masala powder along with chaat masala, adjust salt and mix well. Now add crumbled paneer and cook for few minutes. Remove from heat and add cheese, lemon juice, ginger and coriander. Mix well and set it aside to cool down. Once cooled, divide this mixture into twenty equal size balls, stuff with walnuts and raisins, close and shape them into tikki and set it aside. Heat little oil in frying pan or tawa and shallow fry these tikkis on both side on medium heat. Serve hot with green mint chutney. TIP: Remember we have not added any binding agent like corn flour or maida so the tikkis will be little crumby and very soft, so turn them carefully will shallow frying. Marinate the minced chicken in a mixture of the ginger-garlic paste, lemon juice and salt for fifteen minutes. Also soak the saffron in warm milk. Heat one tablespoon of butter in a pan, add besan and sauté over medium heat till golden brown and fragrant. Remove three tablespoons of the besan and set it aside. To the remaining roasted besan left in pan add bread crumbs, white pepper powder, cardamom powder, fresh coriander, red chili powder, powdered kasoori methi and salt. Mix well. Add this mixture to marinated mince chicken and mix well. Divide this mixture in equal portions and shape them into shami kababs. In a mixing bowl whisk eggs, add caraway seeds, salt, saffron flavoured milk, reserved roasted besan and mix well. Heat sufficient oil in a pan. Dip the kababs in the egg batter and shallow fry till golden brown. Sprinkle the chaat masala and serve with green chutney. Chopped and shredded almonds for garnishing. Dissolve sugar in water and set it aside. To prepare the batter for maalpuda (pancake), take wheat flour in a bowl, add saunf powder, whole saunf and sugar water and make a runny batter. Add more sugar water if required as the batter should be of pouring consistency. For the sauce, heat cream in a pan on low flame. Add three tablespoons honey. Bring it to boil. Increase the quantity of honey if you like more sweet. Let it be on simmer till the sauce thickens. Once done, remove it from flame and let it cool. Heat a pan, put little oil and pour the wheat flour batter and make a 9*10 inches broad medium thin maalpuda. Cook it on both sides. Once done, remove it on a serving plate. Apply cream sauce on entire maalpuda, spread all the dry fruits on the half part of maalpuda and fold the remaining part of maalpuda giving the dish a ‘D’ shape. Apply a layer of malai on top and garnish with chopped almonds. Mix all the ingredients very well and form a dough. 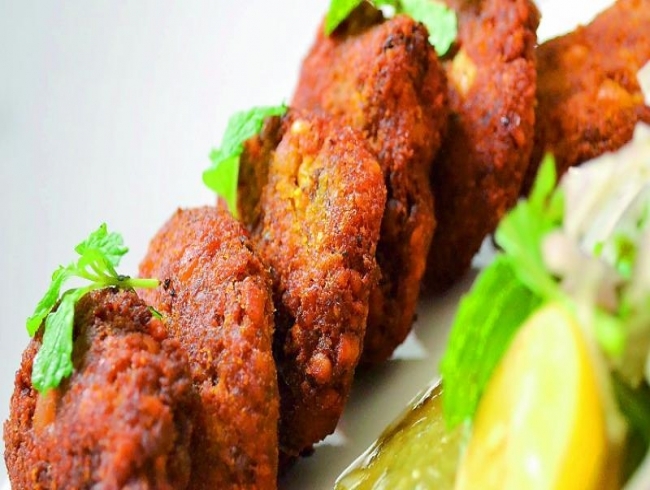 Make the tikkis and shallow fry or deep fry as per your taste. Alternatively, the tikkis can be dipped in corn and maida slurry, coated with soya granules and deep fried. This gives a very crunchy texture to your tikkis. Mix all the dry ingredients. Add the wet ingredients one by one to the mixture. Now add the vegetables and mix well. Finally add the cheese. Combine everything and pour the batter in muffin moulds. Preheat the oven at 2000C for 15 minutes and bake the muffins for 20-25 minutes or until done.